After submitting stool samples for microbiological analyses, many people with intestinal symptoms are informed by their GPs that they have Blastocystis, and that the clinical significance of this parasite is unknown (which is not entirely wrong). However, some GPs may want to try to eradicate Blastocystis in the absence of other potential causes of the symptoms, prescribing drugs such as Protostat/Flagyl (Metronidazole). During and after treatment, many patients will experience temporary alleviation only "to get back to where they started" after a couple of weeks or so. And often, they will also remain positive for Blastocystis (sometimes Blastocystis may be very difficult to detect during the course of treatment and immediately after treatment, which may be due to a transitory decrease in parasite load for direct and indirect reasons; see below). Anyway, this is the classical scenario. The problem with Blastocystis is a circular one: There is currently no single 100% successful treatment, and when people with symptoms + Blastocystis cannot get rid of their parasites and thereby get the chance to report on symptom status after permanently cleared infection (+/-clinical improvement), it is - to put it mild - extremely challenging to collect information and data that can assist us in drawing conclusions. It doesn't make it any better that we know that a lot of people have Blastocystis without knowing and without having symptoms.We therefore shouldn't blame health care professionals for being in the dark. People who do not know a lot about Blastocystis (and who does?) might take to the Internet to get more information, including how to deal with the infection. Not all the advice given on the Internet may be useful and little of it will be based on scientific evidence. Some people may be desperate to try and clear any parasite that they have been diagnosed with, without realising that some parasites might actually be a sign of a healthy gut ecological system and be of potential benefit in terms of maintaining a healthy immune system; we don't know much about this yet. Or maybe the use of antibiotics will damage the general intestinal flora and cause more or more severe symptoms than would the persistence of the parasitic infection! We don't know, but as hinted at in previous posts, our new technologies will assist us in obtaining the information that we have been looking for so long. So, how do we move on from here? There is no doubt that scientific studies are key. Pilot data are available showing that at least one of the genetic variants (subtypes) of Blastocystis is more common in patients with symptoms than in the background population, but this still needs confirmation. The genetic diversity of Blastocystis found in humans is huge. 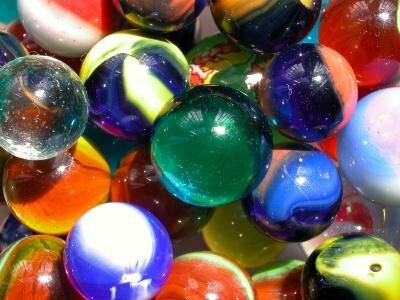 If the genetic diversity of Blastocystis was visible, different subtypes of Blastocystis would probably be as different as these marble balls! We need substantial funding for carrying out large-scale studies aiming to confirm these data. Once epidemiological association has been sufficiently demonstrated, the next step is to find out whether those strains/subtypes associated with disease are characterised by having effector proteins not seen or - maybe more convincingly - not expressed in strains/subtypes seen in healthy individuals. If we have proof of both epidemiological association and expression of virulence genes, then next step could include a randomised control treatment (RCT) study in order to identify the drug(s) that lead to microbiological and/or clinical improvement, i.e. parasite eradication and alleviation of symptoms, respectively. It may be so that different subtypes of Blastocystis respond to different antibiotics. And if successful treatment is dependent on other factors as well such as complex microbial interspecies interactions, it may be perplexing to realise, that different individuals may respond differently to any given treatment. As Pepper and Rosenfield suggest in their paper about microbiome multistability: A key consequence of multistability is that different instances of the same type of system, such as different individual gut microbiomes, may show very different responses to the same perturbation. And so, how does this relate to Blastocystis treatment? Well, since none of the treatments used for treating Blastocystis are specific for this parasite (metronidazole for instance is a broad-spectrum antibiotic used to eradicate a range of anaerobic bacteria, including Clostridium), there will probably be a mixture of direct and indirect effects on Blastocystis upon treatment. The direct effect on Blastocystis will depend on its susceptibility to the antibiotic, while the indirect effect will depend on the bacterial flora and how it responds during treatment. Hence, drugs may directly affect Blastocystis and/or perturb the intestinal flora to an extent which makes it an unsuitable habitat for Blastocystis. We hope soon to be able to investigate the interaction between Blastocystis and gut bacteria by metagenomic approaches. It should be kept in mind though that metronidazole is absorbed from the proximal part of the intestine, while Blastocystis is a parasite of the colon; hence, it may very well be so that metronidazole does not reach Blastocystis in its niche. When treating intestinal amoebiasis, metronidazole is given together with a luminal drug to ensure targeting both invasive and the luminal Entamoeba histolytica. So, while we should keep pursuing the role of Blastocystis in disease, we should also try to explore whether there are some good sides to Blastocystis colonisation and whether we can learn to see the parasite as a proxy for something (clinical condition, enterotype, etc.). I have expanded a bit on this in my recent paper "Thinking Blastocystis Out Of The Box", available in the journal Trends in Parasitology. To this end, learning about the bacterial communities that may influence Blastocystis growth and establishment may improve our ability to understand Blastocystis in an ecological context. In my opinion, in many cases we should "leave Blastocystis alone". In some cases, however, treatment may be warranted. However, currently there are no convincing drug regimens. RCTs needed. For more information, please consult this review.